This third part is dedicated to customization that you cannot make using the generation models. This is where you'll have to code to customize your process. But don't worry, GMF Runtime provides a lot of stuff to make it easier. The complete solution to this tutorial is maintained in CVS here. Viewlets will be available after appropriate sections below to focus their content and keep them short. Although making modifications to the generated code and specifying '@generated NOT' to allow JMerge to preserve our changes works well for some customizations, it's also possible to separate other customizations (extensions) to our generated plug-in using a new plug-in. For this purpose, create a new plug-in project named org.eclipse.gmf.examples.mindmap.diagram.custom to your workspace. Use the default settings, although no Activator class is needed, nor is the use of any of the templates provided in the wizard. The standard means to create a new subtopic is a bit painful at the moment: click on Topic creation tool, then diagram, name with in-place editor, click Subtopic link creation tool, draw link from parent to subtopic. Ideally, we'd like to simply use a right-click menu option on a selected Topic and choose "Create Subtopic" or better yet, press the Insert key (or some combination) and have the new Topic created, including the link, and with the in-place editor active on the new Topic. In this section, we will explore how to accomplish just this. To begin, we know that the org.eclipse.ui.bindings can be used to assign a Ctrl+I key combination to our action (as seen on the image, though for OS X). 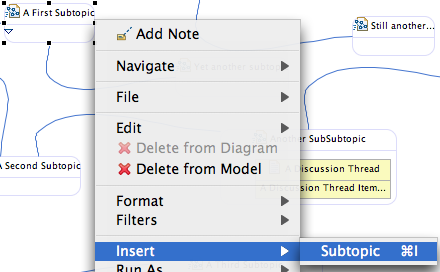 This is easily accomplished by contributing to the extension-point in our new *.diagram.custom plugin.xml file. Note that this is a simplistic example that does not declare a context, as you would probably expect to create for your diagram and potentially extend a default GMF diagram context (if one existed ;-). Now, for the command, we'll contribute to the org.eclipse.ui.commands extension-point, as seen below. When you run your diagram, you will see this command category and the shortcut listed in the General | Keys preference page. Now, for the fun part... to define the declared MindmapCreateSubtopicAction class. To begin, we know that similar functionality exists in the connection handles feature provided by the runtime (see image below). After some investigation, it seems the CreateViewAndOptionallyElementCommand class gives us a hint at how to implement what we want (thanks to Cherie for providing a simplied version of the original tutorial code below, which leverages the DeferredCreateConnectionViewAndElementCommand). // Create the new topic for the other end. Rather than type in the code, simply copy the MindmapCreateSubtopicAction class into your project from the solution in CVS. If you observe any Access Restriction errors, add the required packages to the Exported Packages list on the Runtime of the *.diagram plugin. The basic concepts are outlined next. Run the diagram and test the functionality using the keyboard combination (Ctrl+I) or right-click menu. Note that the subtopic is created above and to the right of the parent with direct editing enabled for you to give it a name. As you can see, the code to determine the position is a temporary hack (layout will be covered in another installment of the tutorial). Clearly, the default layout provided is not appropriate for a mindmap. What we are about to add is also less than optimal, but will indicate what is necessary to add a custom layout to your diagram. As described in the Layout Service Example, we will contribute an extension to the runtime's layoutProviders extension-point. If you run the diagram using both providers, it's clear that the left-right layout is more well-suited for a mindmap, although some adjustments would be necessary to make it more usable. This contribution is added to the org.eclipse.gmf.examples.mindmap.custom plugin.xml file in CVS. GMF Tooling uses XPT templates to generate your diagram code. But it offers the way to use alternative template if you have to tweak directly generated code. This page was last modified 04:03, 30 January 2017 by Aurélien Pupier. Based on work by Ralph Gerbig, Mickael Istria and Michael Keppler and others.